The entertainment you want. Where you want it. The sun is shining and you want to go outside to enjoy the weather and your favourite TV show, sports programme or home movies. The concept of wheeling your living room TV outside can be impractical, and expensive from the damage caused by a sudden downpour of rain. However, there is an alternative. Tech2o’s range of stylish waterproof outdoor tv’s have been designed specifically for all-weather performance and are sunlight readable, durable and designed to operate and perform superbly no matter the conditions. Our televisions deliver crystal clear digital images and will withstand water, snow, and sun exposure ensuring top viewing experience in any circumstances! These products are suitable for use in gardens, on patios, and all outdoor areas and are perfect for home and commercial use alike. High-brightness display. Whatever the weather. Our high brightness outdoor TV screen is up to two times as bright as your typical indoor TV and suitable for areas that are positioned in direct sunlight. Our TV screens are covered with a non-reflective coating to reduce glare and reflection from the screen in outdoor locations. By further enhancing the brightness and contrast levels of the TV panel, the use of this non-reflective coating ensures that the television displays are fully visible and readable in full daylight. From 32″ to 65″. Choose the size that’s right for you. We have a wide range of outdoor televisions available in terms of sizes so you can find the perfect fit for your outdoor TV requirements and applications. Our TV screen sizes available include 32″, 42″, 47″, 55″ and 65″. All with superior brightness capabilities to give them the edge in direct sunlight conditions. Built to weather the storm. All-round protection. Designed to be sleek and elegant in appearance while offering the highest levels of reliability, our outdoor TV’s use an industrial-grade casing consisting of a black powder coated steel frame and tempered glass surface, combined with the best quality build standards. The stylish, slim and compact steel casing is durable, rust proof and hardwearing. The 5mm toughened, tempered and scratch proof glass front is strong and secure. The glass is even dipped in a non-reflective coating when manufactured ensuring the displays can be viewed with ease in bright conditions. All internal components are silicone sealed to endure changes in weather conditions. On the rear panel you’ll find an innovative water tight cable entry compartment to protect the cable connections from water or moisture. Due to their superior quality, attention to detail and elegant styling, it’s no wonder that today, Tech2o outdoor televisions are rapidly becoming the “must have” choice for home and commercial users alike. Full HD. Smart TV. Freeview HD. All as standard. 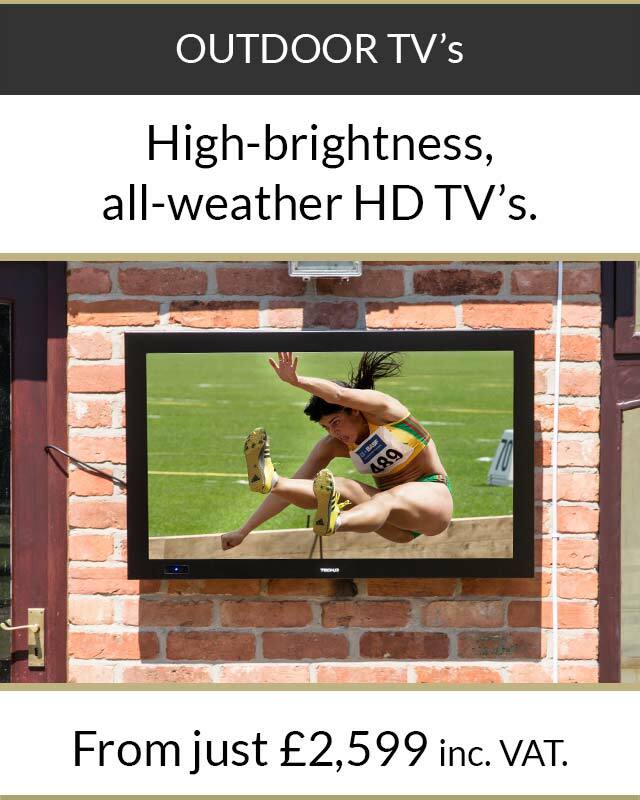 Just because it’s an outdoor TV shouldn’t mean you have to compromise on the features you want. We want your Tech2o tv to deliver the entertainment you want without fuss and complication – and with no need for additional media players or devices. We only use high-quality LG screens that provide astonishing Full HD (1920×1080) picture quality. 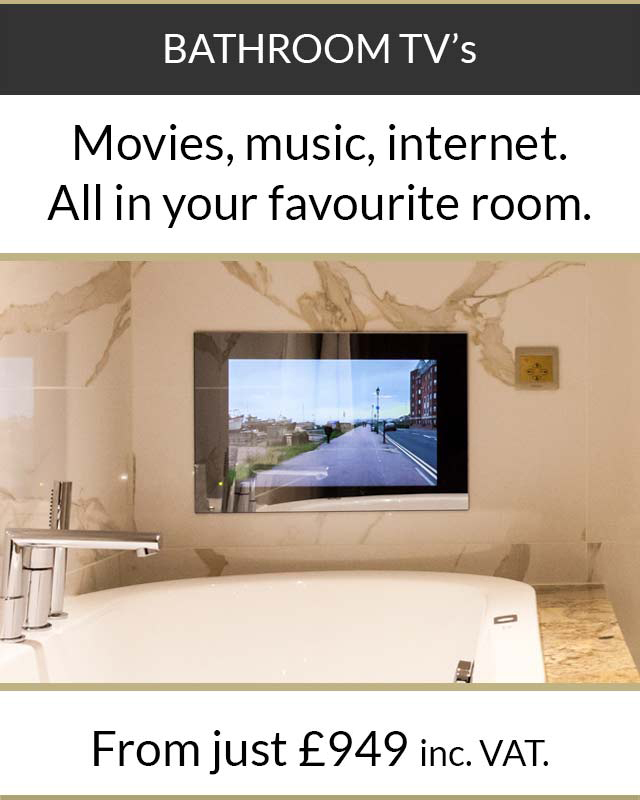 Built-in Smart TV gives you direct access to a world of home entertainment – from social media apps, through to streaming music and videos – or even just web browsing. 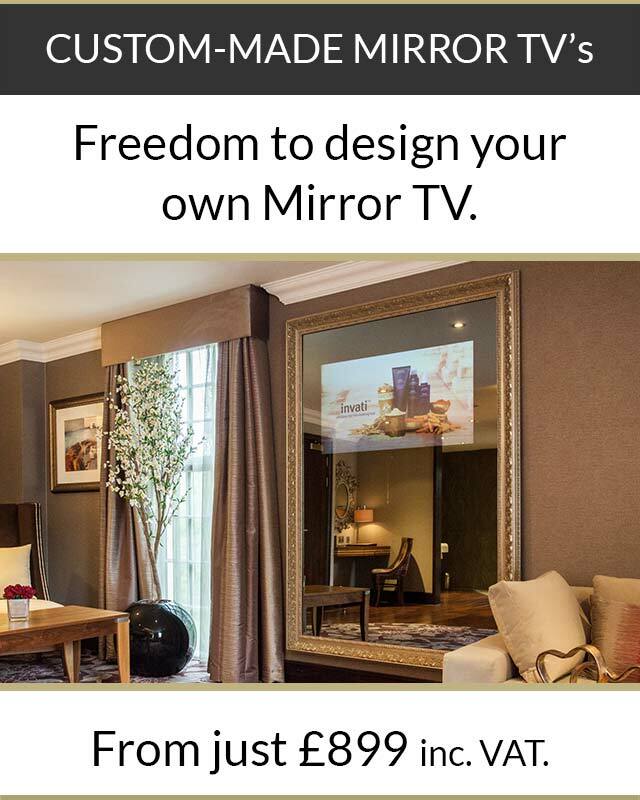 All of our TVs also come with a Freeview HD receiver built-in as standard, letting you access the HD service, as well as up to 50 standard definition channels and radio stations – all for free! Simple integration into your home entertainment system. When it comes to integration into a complete home entertainment system, a Tech2o Outdoor TV is always the installer’s first choice. The built-in Sky Magic Eye IR Link System let’s you watch and control your Sky TV Box from your bathroom. RS-232 control enables the television’s standard functions to be controlled as part of a home automation system. Installers can also benefit from our use of discrete IR codes for most functions and Infra-Red IN/OUT capability. It’s easy to install a Tech2o outdoor TV safely and securely. Our outdoor televisions have been specifically designed for surface mount purposes. Each television has VESA fixing holes on the back meaning you can mount it directly onto a surface quickly, easily and conveniently. 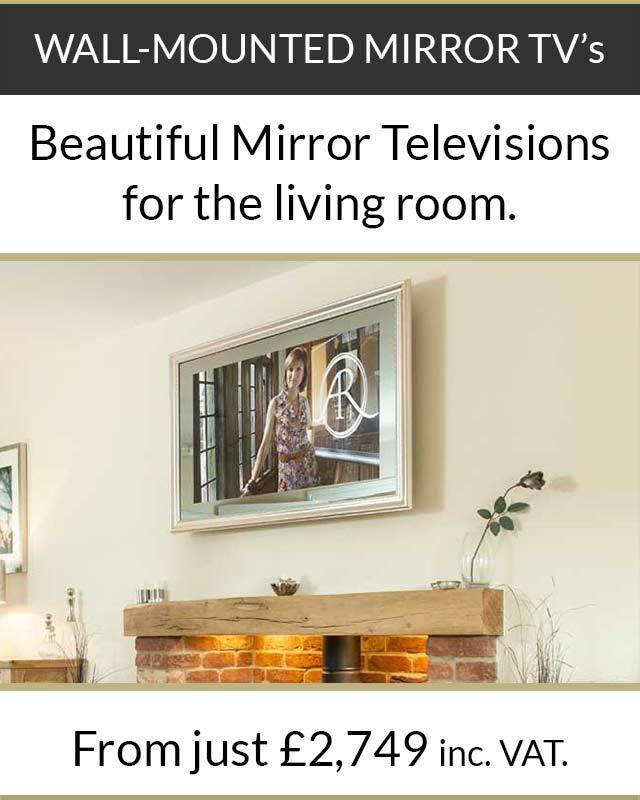 Our TVs come complete with a theft proof wall-mounted bracket and screen cover to ensure that your TV keeps safe, secure and hidden when not in use. Our robust waterproof remote controller let’s you control your outdoor tv from up to 8 meters away! The ultra-slim controller offers full control of your outdoor tv, as well as having learning functions to allow it to be used with other devices too. The remote control is IPX5 rated allowing it to be handled with wet hands and even operate if fully submerged in water. These specifications are common to all models. For more detailed ‘per model’ specs, please see the individual product listings in the store. If your chosen product is in stock, we aim to deliver the next working day in the UK. However, some of our products are made to order, in which case we will contact you with a delivery date. We are able to ship worldwide – the shipping calculator in the shopping cart will automatically calculate the costs based on your delivery address.